Some clouds this morning will give way to generally sunny skies for the afternoon. High 64F. Winds NNW at 5 to 10 mph.. 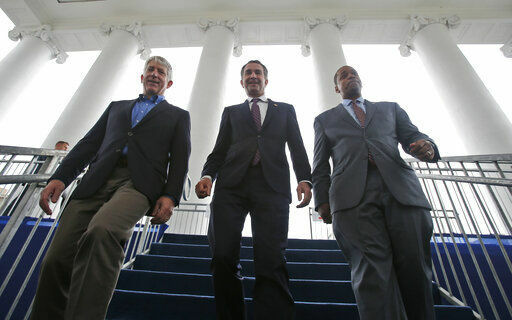 In this Jan. 12, 2018 file photo, Virginia Gov.-elect, Ralph Northam, center, walks down the reviewing stand with Lt. Gov-elect Justin Fairfax, right, and Attorney General Mark Herring at the Capitol in Richmond, Va. All three of Virginia's top three elected officials -- all Democrats -- are embroiled in controversy. Since the fall midterm elections, Republicans have been down in the dumps and Democrats have been riding high and mighty. Democratic leaders spent January gloating about retaking control of the House of Representatives, coming up with 152 ways to impeach President Donald Trump and voicing support for the dumb legislative ideas of their star rookie socialist, Rep. Alexandria Ocasio-Cortez of New York. Rep. Adam Schiff, my southern California congressman, has promised every camera he’s looked into since November that his House committee was going to spend the next two years investigating several decades of Donald Trump’s business records, tax returns and, if necessary, his golf scores. First to topple was Gov. Ralph Northam, a pediatrician who already recently shocked much of the country by advocating the abortion of a full-term infant with deformities after it was born. What really got Northam in deep trouble with his own party happened a few days later, when unflattering pictures of him surfaced from a 1984 medical school year book. Northam was seen either in blackface or wearing a KKK hood. No one — including him — was sure which person he was. He ended up denying it was him in either racist costume, but then confessed at a bizarre press conference that he once wore blackface as part of a Michael Jackson impersonation — and even offered to perform a “moonwalk” for reporters to prove it. While Republicans chuckled at the antics of the Democrats of Virginia, and almost everyone in his own party clamored for Northam to resign, we learned that Lt. Gov. Justin Fairfax, the next in succession, was in even more serious trouble. A professor from Southern California had publicly, graphically and credibly alleged that Fairfax violently sexually assaulted her at the Democratic National Convention in Boston in 2004. In the post-Judge Brett Kavanaugh era, where liberals have declared that sexual assault victims always are to be believed, that means Fairfax almost certainly is a goner, no matter how strongly he denies the woman’s allegation. It’s not something their party wants to see happen, no matter how guilty they all may be, because if they all go, a Republican — state House Speaker Kirk Cox — would become governor of Virginia. As if the Virginians didn’t do enough damage to the Democrat Party last week, Sen. Elizabeth Warren also did her part. As I said, last week it was great to just sit back and laugh. 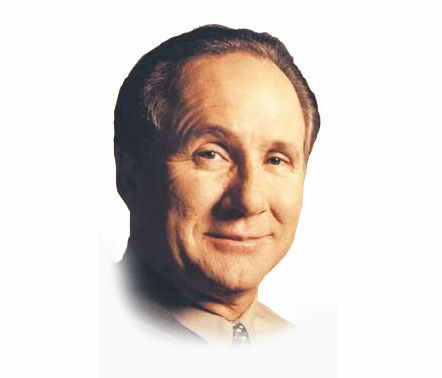 Michael Reagan is the son of President Ronald Reagan, a political consultant and the founder of the email service reagan.com.